Dr. Christina Wroblewski-Madden and the staff at Christina Wroblewski-Madden DDS in Anderson believe that each of our patients deserves a smile they can be proud to show off. We offer a variety of cosmetic dentistry solutions to correct such common aesthetic flaws as stained teeth, broken teeth, or teeth that are chipped, cracked, misshapen, or crooked. Be sure to visit our online smile gallery to see some of the stunning results Dr. Wroblewski-Madden and the Christina Wroblewski-Madden DDS team have achieved for our cosmetic dentistry patients. We invite you to learn more about the cosmetic dentistry procedures offered by Dr. Wroblewski-Madden and then contact us at 765.644.1000 to schedule your smile makeover consultation. Teeth whitening is perhaps the most common cosmetic dentistry procedure at Christina Wroblewski-Madden DDS. Even the most beautiful smile can appear unhealthy or dull when teeth are stained or yellowed. In as quickly as one brief session, our patients can enjoy smiles that are up to ten shades brighter. There are many over-the-counter products available to whiten your teeth at home, but these products cannot match the whitening strength of the professional-grade treatments provided at Christina Wroblewski-Madden DDS. Dental implants are titanium posts that are surgically inserted into a patient's jawbone to support permanent replacement teeth. Unlike dentures, dental implants never need to be removed for cleaning, and they allow for more comfortable eating and speaking. Schedule a consultation with Dr. Wroblewski-Madden to find out if you are a candidate for dental implants. 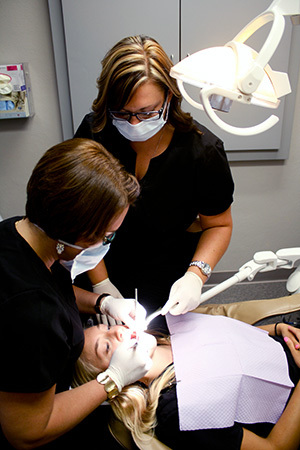 At Christina Wroblewski-Madden DDS, we provide the latest advances in cosmetic dental techniques. Cosmetic dentistry includes more than just whitening teeth, it includes veneers, bonding, gum recontouring, crowns, bridges and fillings. Many of Dr. Wroblewski-Madden's patients combine a number of cosmetic dentistry procedures to achieve the ultimate in smile design. For example, a patient may choose to eliminate the "gummy" appearance of his or her smile with gum recontouring, and then enhance the results with a teeth whitening session. To learn more about the cosmetic opportunities available to our patients, we encourage you to make an appointment to consult with a member of the Christina Wroblewski-Madden DDS team at our Anderson office. Call us today at 765.644.1000 to learn more about how we can help you smile brighter.